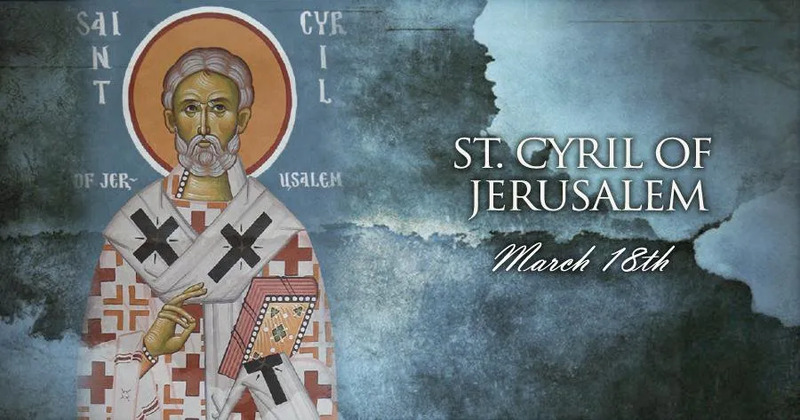 On March 18, the Roman Catholic Church honors St. Cyril of Jerusalem, a fourth-century bishop and Doctor of the Church whose writings are still regarded as masterful expressions of Christian faith. St. Cyril is also remembered for his exhaustive Biblical knowledge, and his endurance in the face of misunderstanding and opposition. Eastern Catholics and Eastern Orthodox Christians, who likewise celebrate him as a saint on March 18, also remember him on May 7 – the date of a miraculous apparition said to have occurred soon after his consecration as a bishop. What we know of Cyril's life is gathered from information concerning him from his younger contemporaries, Epiphanius, Jerome, and Rufinus, as well as from the fifth-century historians, Socrates, Sozomen and Theodoret. Cyril was most likely born in Jerusalem around the year 315, shortly after the legalization of Christianity throughout the Roman Empire. Although that legalization put a stop to many of the persecutions that threatened the Church for two centuries, it indirectly gave rise to a number of internal controversies – both in regard to theology, and the jurisdiction of bishops – in which Cyril would find himself involved. Cyril received an excellent education in classical Greek literature as well as the Bible. He was ordained to the priesthood by Bishop Maximus of Jerusalem, and succeeded him as bishop in 348. During his early years as a bishop, most likely around 350, he delivered a series of lectures to new initiates of the Catholic Church. Twenty-four of the lectures have survived and are studied today. In a 2007 general audience, Pope Benedict XVI praised the saint for providing an “integral” form of Christian instruction, “involving body, soul, and spirit.” St. Cyril's teaching, the Pope said, “remains emblematic for the catechetical formation of Christians today. In 351, three years after Cyril became the Bishop of Jerusalem, a large cross-shaped light appeared for several hours in the sky over the city – an event that many interpreted as a sign of the Church's triumph over heresy. It could also, however, be understood as a sign of the suffering the new bishop would undergo in leading his flock. Unlike many other Eastern bishops and priests of the fourth century, Cyril did not allow his classical learning to lead him away from believing in the full humanity and divinity of Christ. However, the man who consecrated Cyril as a bishop, Archbishop Acacius of Caesarea, was an ally of the Arians – who claimed that Jesus was a creature and not God. Because of his connection to the archbishop, Cyril himself was unjustly suspected of heresy by many of his brother bishops. But he also found himself at odds with Archbishop Acacius, who claimed to have jurisdiction over the birthplace of the Church. Altogether, these disputes led to Cyril being exiled from Jerusalem three times in the course of 20 years. Cyril first took refuge with Silvanus, Bishop of Taraus. He appeared at the Council of Seleucia in 359, in which the semi-Arian party was triumphant. Acacius was deposed and St. Cyril seems to have returned to his see. But the emperor was displeased at the turn of events, and, in 360, Cyril and other moderates were again driven out, and only returned at the accession of Julian in 361. In 367, a decree of Valens banished all the bishops who had been restored by Julian, and Cyril remained in exile until the death of the persecutor in 378. In 380, St. Gregory of Nyssa came to Jerusalem on the recommendation of a council held at Antioch in the preceding year. He found the Faith in accord with the truth and expressed admiration of his pastoral efforst, but the city was a prey to parties and corrupt in morals. In 381, St. Cyril participated in the Second Ecumenical Council, which condemned two different forms of Arianism and added statements about the Holy Spirit to the Nicene Creed of 325. St. Cyril of Jerusalem died in 387, and was named a Doctor of the Church by Pope Leo XIII in 1883.